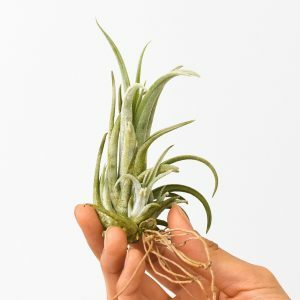 View cart “Tillandsia Xerographica Medium” has been added to your cart. Limited time only: Free Domestic Shipping on orders over $35! 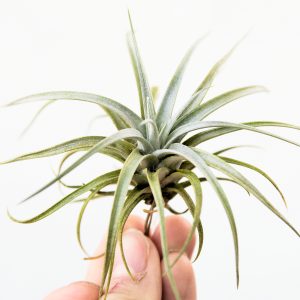 Welcome to Air Plant Greenhouse! 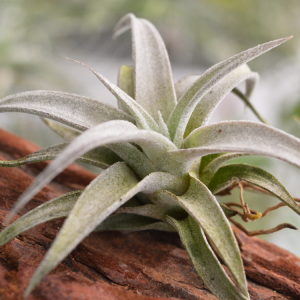 We are an online greenhouse where you can buy quality air plants for low prices. 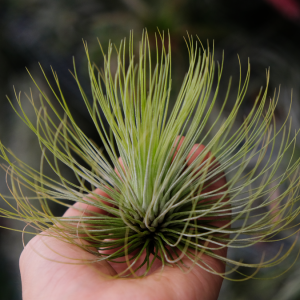 We have hundreds of airplants for sale at our greenhouse in all shapes colors and sizes. If you are looking for bulk pricing for your craft ideas or events, please see our section for wholesale discounts. 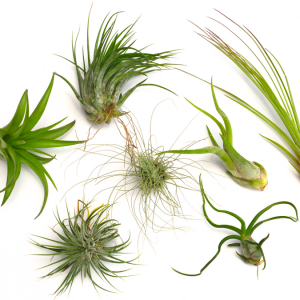 If you are new to air plants, please feel free to read our complete guide care of your plants. Did you know? 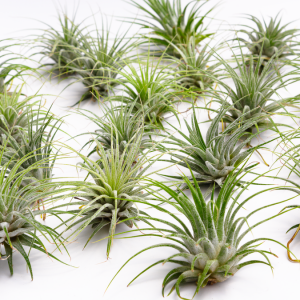 Air plant is another name for Tillandsia, a member of the pineapple family. These plants do not need to be potted in soil. All they need is water, light, and the right environment to thrive. 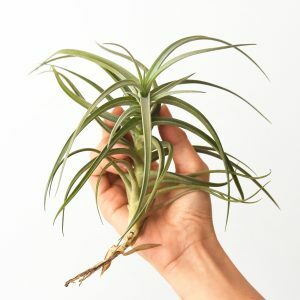 Unlike plants that absorb water through the roots, tillandsias only use roots to secure themselves to a tree or a rock. They use their leaves to absorb water and nutrients. 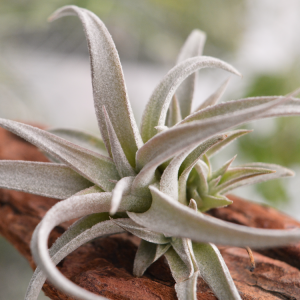 Tillandsia Pueblensis is an air plant with very thick leaves that are covered with a visible layer of silvery trichomes. These plants have a curved appearance which make them great for driftwood displays. Fairly drought tolerant. 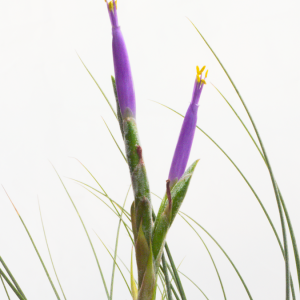 The succulent foliage of Tillandsia Chiapensis has a beautiful tinge of lavender. 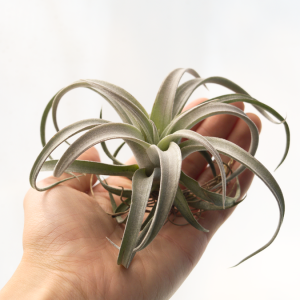 This air plant grows into a nice rosette with a beautiful pink spike at the center when it blooms. 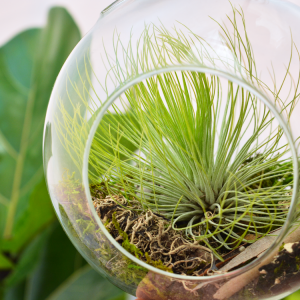 Perfect for terrariums and crystal air planters. Tillandsia Caput Medusae Purple has some dark purple edges around the leaves. 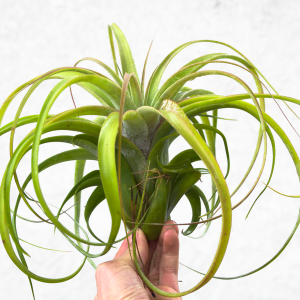 A fun looking air plant has wiry leaves that spread out like a jellyfish. 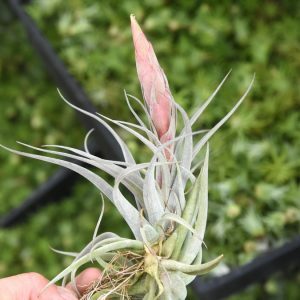 Tillandsia Caput Medusae Purple produces very colorful and inflorescence during blooming season. 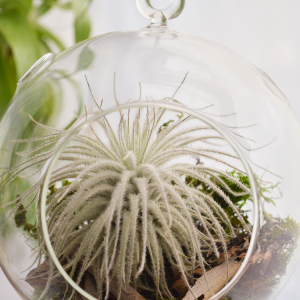 Perfect for terrariums or hanging air planters. 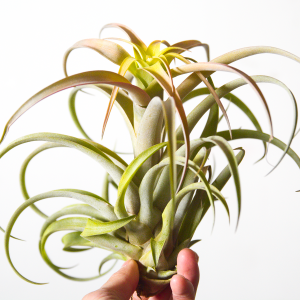 Tillandsia Scaposa (Kolbii) has soft green leaves that spread out to form a fountain shape when it grows bigger. 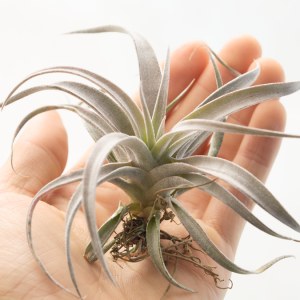 This small air plant clumps quickly with a lot of water and bright, indirect light. Looks great in sea urchin planters and glass terrariums. 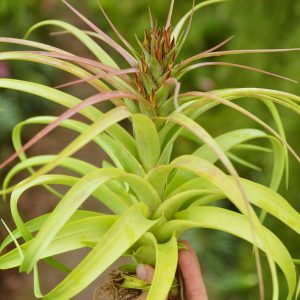 Tillandsia Peru Inca Gold is a fragrant air plant that makes an awesome display air plant. 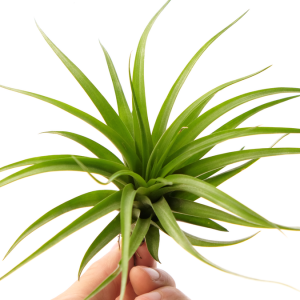 The plant tends to grow horizontally to form a nice fan shape. Produces fragrant golden flowers which is very rare among all Tillandsias. Pups easily off leaf branches and forms a clump after a while. 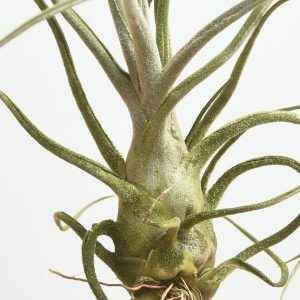 This unusual looking air plant features mossy textured leaves which are covered in a thick coat of trichomes. 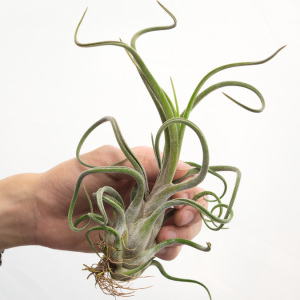 Tillandsia Pruinosa Giant Form is a larger cultivar of the closely related Pruinosa which grows to a much larger size. A rare addition to any plant collection. 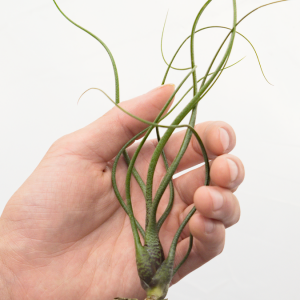 I’m currently offering a medium/large size Tillandsia Brachycaulos that you can grow out to a much bigger plant of about 8-10″ across. 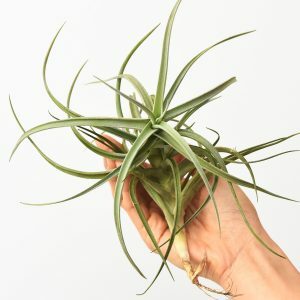 This air plant is very easy to grow. 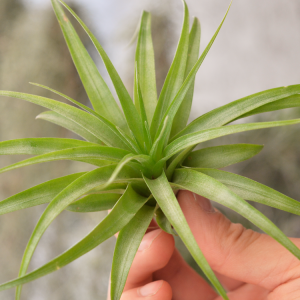 Brachycaulos has lush green foliage that turns bright red during blooming season. 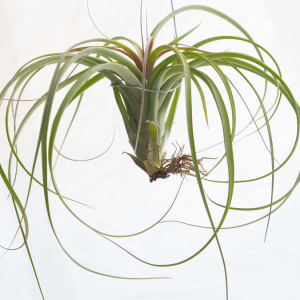 A beautiful air plant for terraiums and hanging air planter. 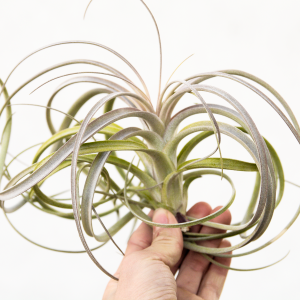 This air plant is a stunning cross between Tillandsia Xerographica and Tillandsia Brachycaulos. 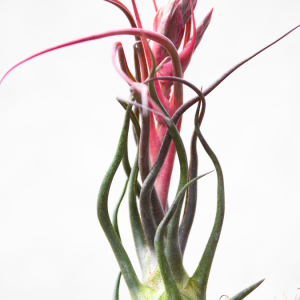 The succulent green leaves form a beautiful rosette similar to that of a Xerographica. When blooming, this hybrid produces a showy yellow inflorescence. 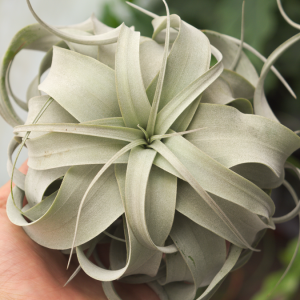 Tillandsia Mima Chilitensisis a drought-tolerant air plant with silvery green stiff leaves. 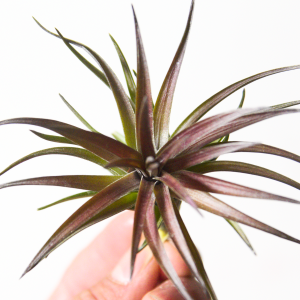 This air plant gets a light blush of purple when grown in bright, indirect light. A wonderful terrarium plant for large and teardrop terrariums. 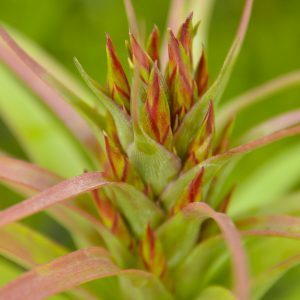 When blooming, this plant pups along the flower spike, an unusual trait found in several air plants. 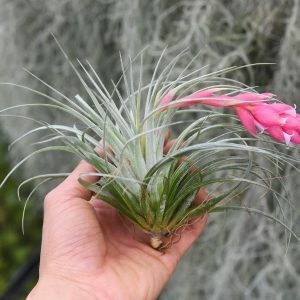 Tillandsia Tectorum is the fuzziest kind of air plant that there is! 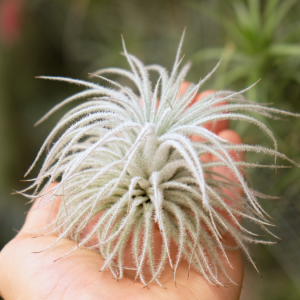 This furry air plant is covered with a dense coat of trichromes to help it absorb water in its natural habitat. A very drought-tolerant plant. 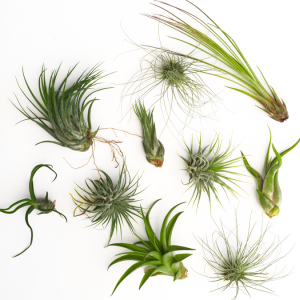 Display your tectorum in a terrarium or by itself on the desk. 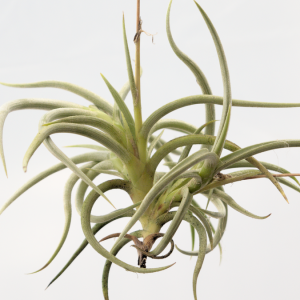 This air plant is hard to dry out so only spritz it with water instead of soaking it completely. It enjoys air circulation so make sure it dries out completely after each watering. 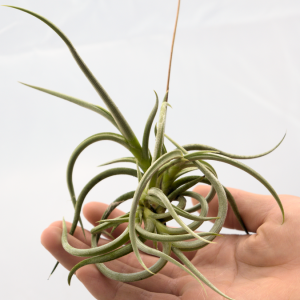 Tillandsia Myosura has a unique form with curly, succulent leaves. Myosura forms clumps very quickly. 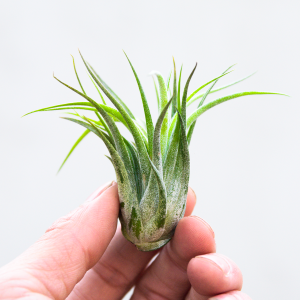 This makes it a great air plant to have if you want to propagate your own tillandsias from the pups. Looks great in a hanging air planter or desktop planter. 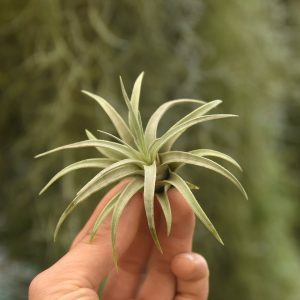 Tillandsia Brachycaulos Selecta Streptophylla is a rare hybrid that looks very impressive by itself or on a hanging air planter. 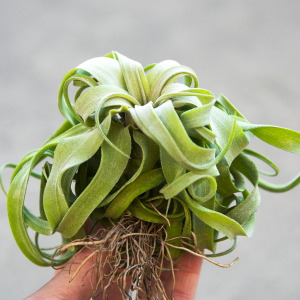 Succulent green foliage gently curls back from the center and hangs around the plant to form a large rosette. 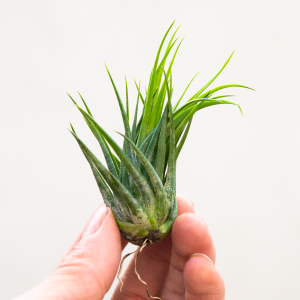 Brachycaulos “Selecta” x Streptophylla is a must-have for collectors! 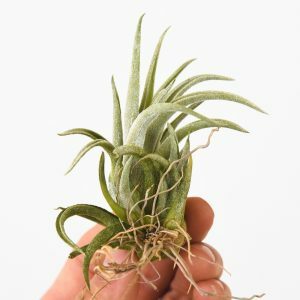 Tillandsia Seleriana x Bulbosa has thick and fuzzy leaves that sprawl out in a truly wacky way. 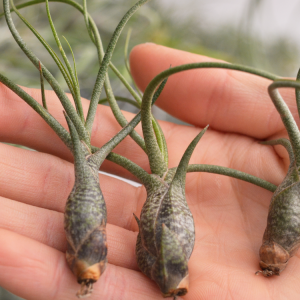 Like the parents Tillandsia Seleriana and Tillandsia Bulbosa, this hybrid has a large pseudobulb on the bottom. 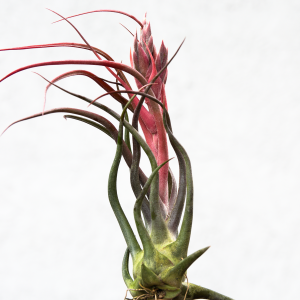 When in bloom, the air plant turns a semi-purple in the midsection and a dark red on the spike. 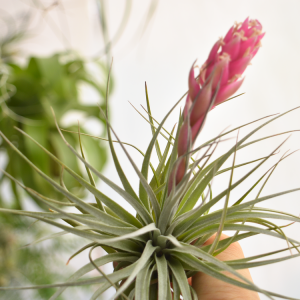 Tillandsia Houston Pink Princess produces a giant pink inflorescence with lilac flowers when it blooms. 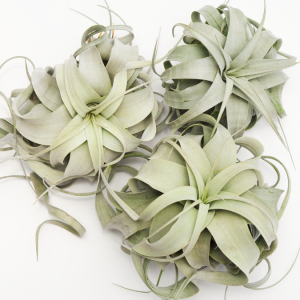 This beautiful air plant is perfect for large terrariums or hanging air planters. Plant may not be in bud upon arrival. 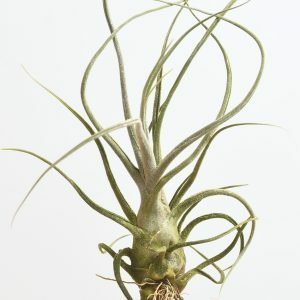 Tillandsia Exserta X Fasciculata is a large air plant. Very hardy and easy to grow. The long and spindly leaves extend from the center into a bush form. 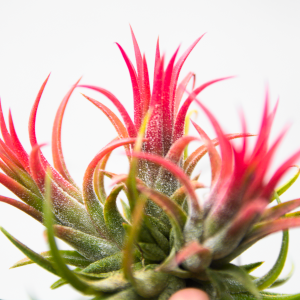 When in bloom, one or multiple red spikes emerge from the center of the plant. 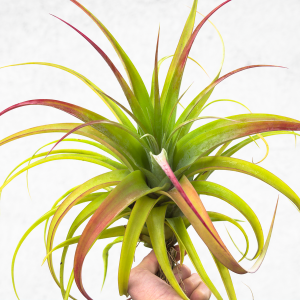 This colorful air plant has a tinge of purple in the center. 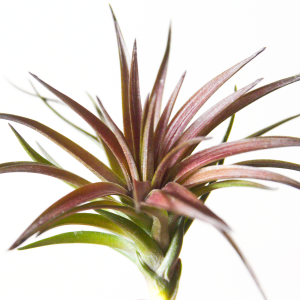 Spiky, dense leaves spiral from the middle to give this Tillandsia Tenuifolia Purple Fan its symmetrical shape. 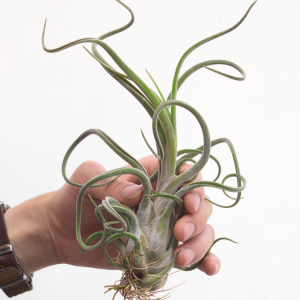 A wonderful air plant for terrariums and desktop air planters. 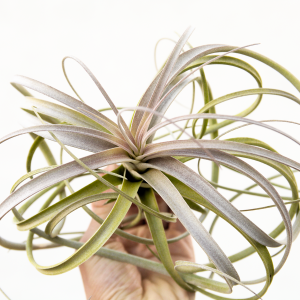 Tillandsia Correale X is a slow-growing thick-leaf air plant with a crown of silvery leaves. It has silvery leaves in a crown rosette and a large thick pink flowers when blooming. Currently in bud as shown in pictures. 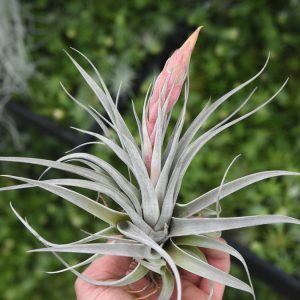 This large budding Tillandsia Bradeana x Roland-Gosselinii specimen is spectacular! 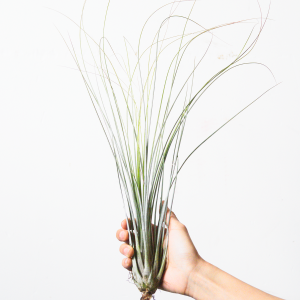 This air plant is a hybrid between Tillandsia Bradeana and Tillandsia Roland-Gosselini. The leaves are typically green but turns lime-yellow similar to Rothii near flowering. 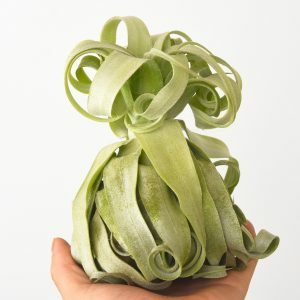 This LARGE air plant looks fun by itself or in a terrarium! 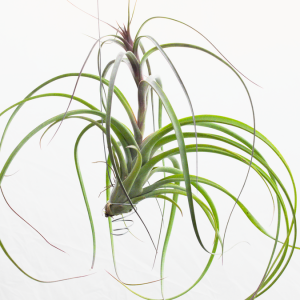 Tillandsia Andreana (open form) is rare in cultivation. The lime green foliage grows into a beautiful dome in humid environments. 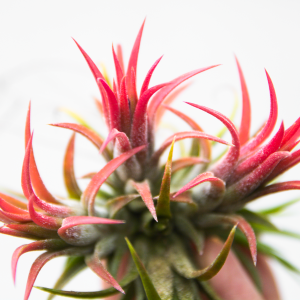 This tillandsia is a cluster of Ionantha Peanut/Fuego. 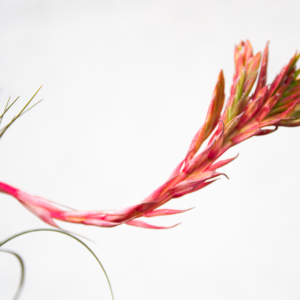 Out of all tillandsias, tillandsia peanut/fuego has the brightest red blush in winter. Currently, all of my peanut/fuego clumps are blushing. To keep them red, expose them to bright indirect light. Direct sunlight through a window is okay but keep the plant well-hydrated. 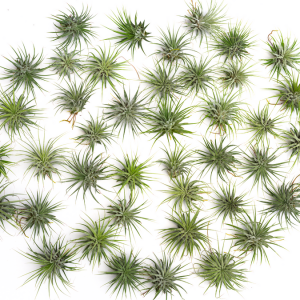 With air plant clumps you can either keep them in a clump or break them up into individual air plants. 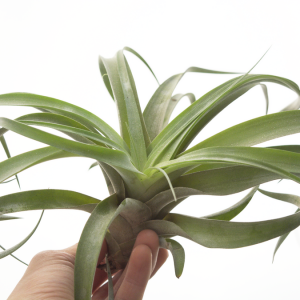 This ionantha has a strong clumping and produces more pups over time. Each mother plant clump comes with about 3-5 heads. 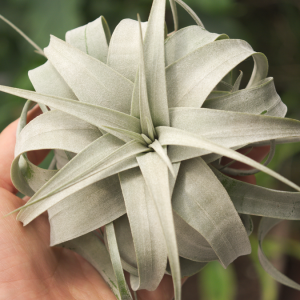 Tillandsia Exserta has silvery green leaves that recurve from the center to form a beautiful rosette. 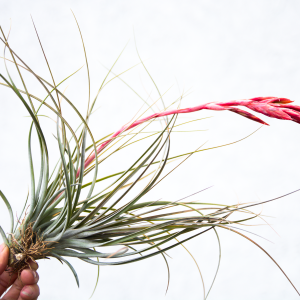 Tillandsia Exserta produces a stunning red inflorescence when it blooms. Perfect for displaying on a shelf or hanging it on a macrame hanging air planter.